STEP 2. 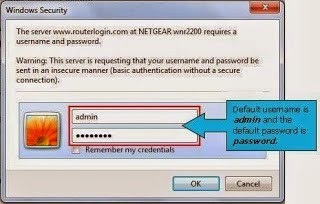 Access the router menu by opening a browser and typing in the address bar www.routerlogin.com orwww.routerlogin.net. STEP 3. Type in the user name admin and the password (the default is password in lower-case letters). STEP 4. Click the Advanced tab and then select Setup > LAN. STEP 5. In the IP Address field, change the LAN IP address of the router to 192.168.1.100 (same IP segment of the main router, 192.168.1.1) and clear the DHCP server check box. Then click Apply. STEP 6. Select Wireless Setup, and specify the wireless settings that you require (SSID, Channel, Security). STEP 7. 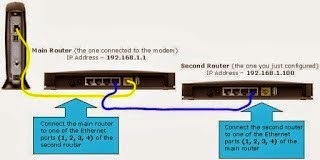 Connect the router that you just set up as an access point to one of the available Ethernet ports of the other router in the network (the main router). Powers cycle both of the routers. The second router now is set up and connected to function as an access point.